I try to avoid getting political on this here forum, but every now and then something strikes my fancy. In this case it’s two articles that are pitted against each other. The first was written by the well known Thomas Friedman (The World is Flat) and the second by an [almost] equally well known writer for the New Yorker, Hendrik Hertzberg (Ombános). Each has its own merits and flaws, but it was interesting to me to read both and come to my own conclusions (which I will spare you from knowing). Take a gander and if you choose leave your thoughts in the form of a lovely [respectful] comment! TO Barack Obama, John Boehner, Harry Reid, Mitch McConnell, Nancy Pelosi and Eric Cantor, I just have two words of advice: Herbert Hoover. Thomas L. Friedman’s latest column, one of his mock memos, damn near ruined my Sunday. All jokes aside friends, while I may dominate the savory side of the kitchen [and do pretty good for myself if I do say so] Miss Fancy Boots should seriously open up her own bakery. She’s often meandering [audibly at times] through several options of what her next career will be and how she’ll find it. The wiser wolves in the den always said [and I am now living it firsthand] that if you love what you do, you’d never work a day in your life. Couple that will being really ridiculously good at what you do and you’re an unbeatable force. Thus, I consider this my formal offer, nay plea, for folks to send MFB some seed money to get this bakery off the ground. I mean heck, even her eight-year-old nephew wants to work in a bakery one day (you’ll have to ask her to tell you that story… hilarious). So I present to you MFB’s latest take on a Southern Living recipe and what quickly became my favorite dessert of the summer, period. 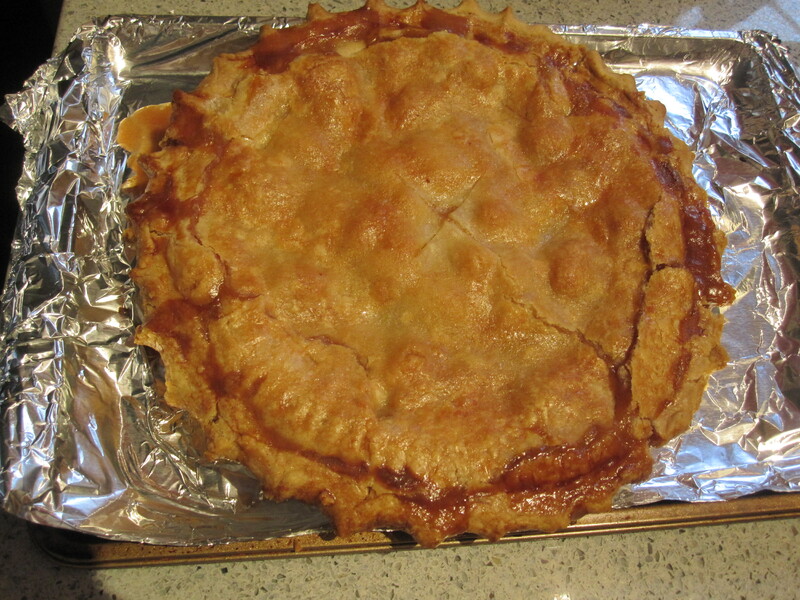 Take piecrusts out (preferably frozen pie crust) set on counter and let thaw to soften dough. Carefully place other piecrust over filling; press edges of crusts together to seal. Crimp edges of pie. Brush top of pie with beaten egg; sprinkle with 1 ½ Tbsp. granulated sugar. Cut 4 to 5 slits in top of pie for steam to escape. Freeze pie 15 minutes. Meanwhile heat pan in oven 10 minutes. Place pie on hot pan. Bake at 425F on lower oven rack 15 minutes. Reduce oven temperature to 375F; bake 40 minutes. Cover loosely with aluminum foil to prevent excessive browning, and bake 25 more minutes or until juices are thick and bubbly (juices will bubble through top). Transfer to a wire rack; cool 2 hours before serving. Try it with some good ole milk or get fancy and tasty some bubbly. Every now and then the chef just needs a break from the kitchen. We all like to be waited on once and while. And, let’s be honest, nothing is better than having no clean up! That said, I’ll introduce you one of Miss Fancy Boots (and my) favorite places on a beautiful day. The perfect way to spend sunset on a summer evening. What are the keys that make this place so good? 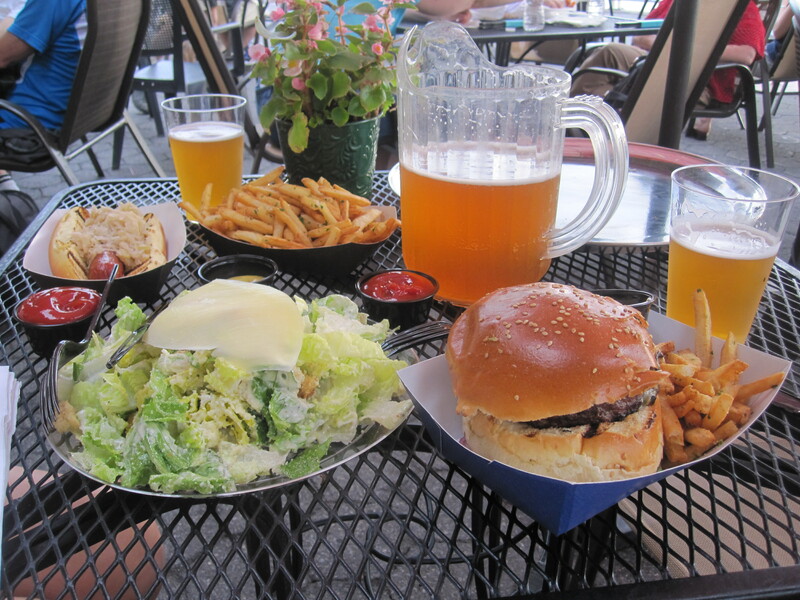 First, that burger is a 1/4 lb of Pat LaFrieda beef, which means it’s high quality, juicy and therefore tasty. You can get it with either a nice slice of cheddar or some delicious crumbled blue cheese (which I highly recommend). You can never go wrong with Old Bay fries so they need no further explanation. The salad was surprisingly crisp and fresh and I could imagine being quite filling with some grilled chicken laid on top. What makes a good hot dog is the sum of its parts. In this case, the Hebrew National is 100% beef, which means (besides being kosher) it just tastes better. Wash it all down with the unofficial beer of summer in Sam Adams Summer Ale and you’re all set to sip away while the sun sets across the river. If you hadn’t caught on to it yet, growing up around the water means you eat a lot of seafood. Unless, of course, God forbid someone has a shellfish or seafood allergy. In which case you might as well just move to a landlocked state and be done with it all. You’ve probably also noticed that I always try to advocate for local, wild-caught seafood over the corn fed farmed version. There’s an important difference between the two options for both you and the environment in terms of health. It should be obvious, but the local, wild-caught variety are much better than the farmed version. Provided that the species isn’t overfished, this will always be true. At first thought one might assume there’s less options for local, wild-caught seafood in NYC than coastal Virginia– even I was naive enough to think that at one point. However, geographically the two areas are similarly situated as bodies of land surrounded by open bodies of water and their feeding tributaries. This means the two areas are more the same than different and it makes sense in the local seafood offerings, which are eerily similar. Today’s post features one of these creatures. Heat a pan coated in EVOO over low-medium heat. Key here is not to heat the oil quickly as it will reach it’s evaporating temp too quickly, which you’ll want to avoid. Go ahead and grind some sea salt and black pepper into the oil as it warms. Don’t go overboard on the salt to save your cholesterol and blood pressure. If you prefer, you can use garlic salt as well. Bring a pot of water with a steaming pan to boil. Throw your shrimp in, season with Old Bay and cover. After a few minutes, add your butter (cut into smaller pieces), turn shrimp over and season again with Old Bay. 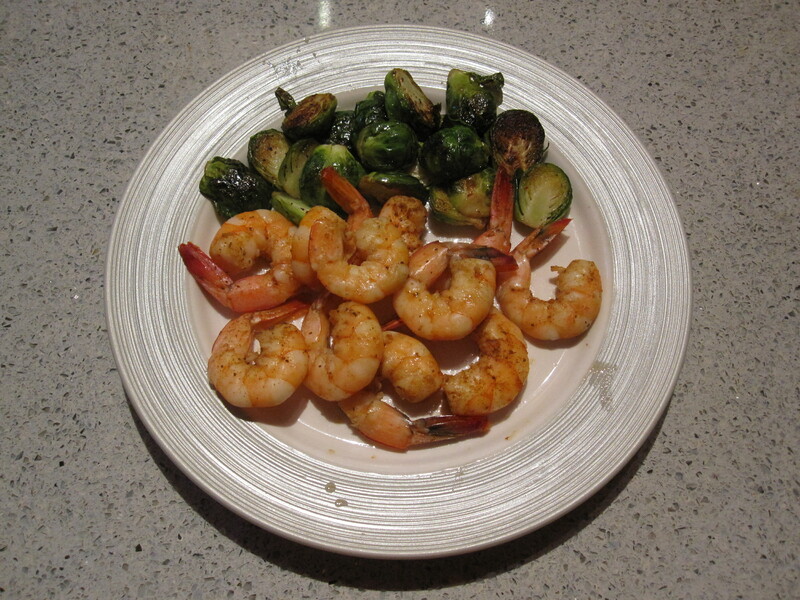 Cook the shrimp until just pink on both sides then remove and serve alongside the brussel sprouts. A true taste of the sea you can enjoy anywhere you may be. I would say around 65% of the time I’ll dip my chicken tenders in ranch when it’s there over other options like barbecue, honey mustard and the likes. So then I had this brilliant idea. What if I just baked the ranch right on in to the chicken tender? So that’s exactly what I did and you can too! A tasty combination, for sure! Preheat oven to 400°F to begin. Start by mixing your ranch dressing (about a cup) and bread crumbs (1/2 cup) in a medium bowl. Add a touch of EVOO. 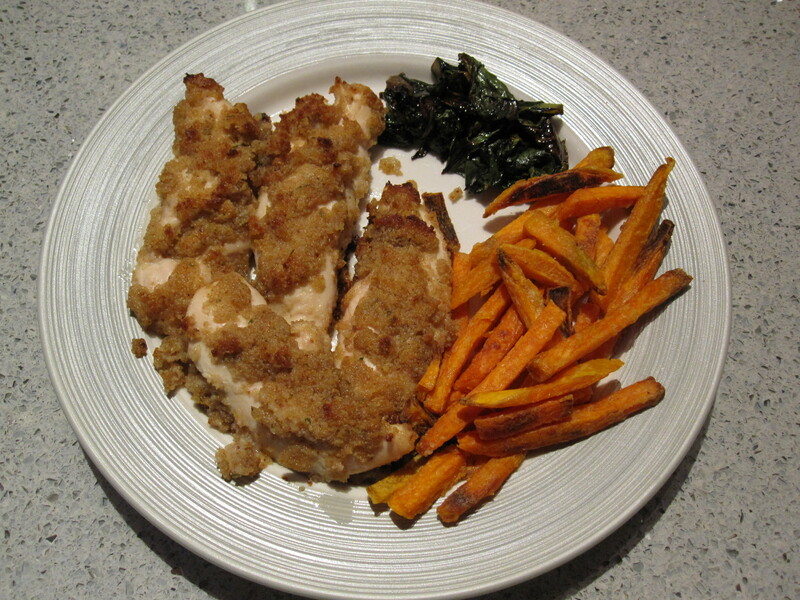 Take your chicken tenders and rub both sides in your mixture then place on a greased baking sheet. Bake for 12-18 minutes or until crisp on outside and cooked through. Cut and place your chard in a frying pan and drizzle with honey. Cover and simmer for approximately 8 minutes. It’s that time of year again, comes once every fall. The Hokies of the world descend upon Blacksburg to start the school year, which today means inevitably every social media outlet is flooded with obligatory comments bragging of being in Blacksburg. Tweets of coffee & ice cream at Deets and check-ins at Kobe, Chipotle, Starbucks & Hokie Grill have already appeared. And, of course, posts of the first TOTS Tuesdays are only a few hours away. Alas, the ones that make me yearn for Blacksburg the most feature Cabo Fish Taco, my all time favorite restaurant. Ironically enough I have yet to find a competitor in NYC that fits the same theme of Baja cuisine. 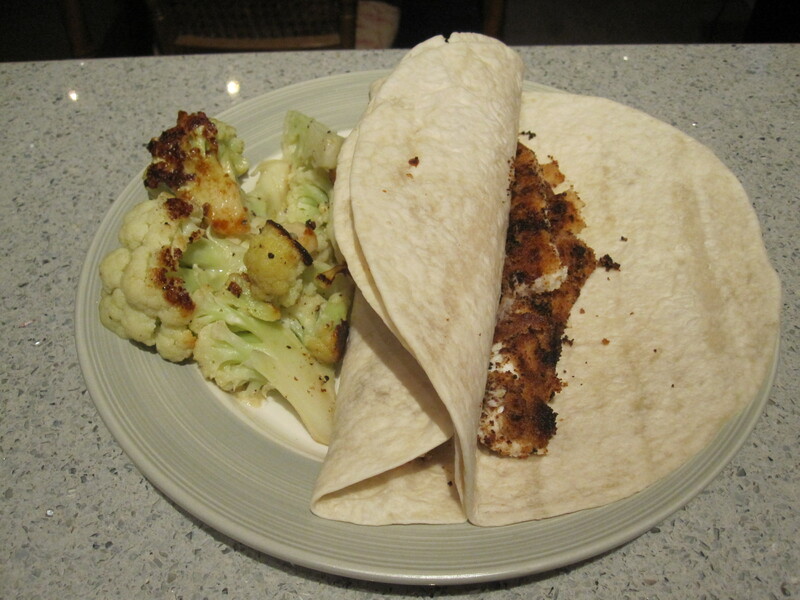 My search coming up dry for over a year and half now I resorted to making my own fish tacos awhile back. While not nearly as delicious as Cabo’s, if you’re having the same craving I was they’ll make do. Well until you can get to Blacksburg and have the real thing, preferably on a home football game weekend. Lightly (seriously lightly) spread the mayo over the fish fillets. Place both sides into a bowl of your breadcrumbs to produce a thinly breaded layer. Place fillets on a greased non-stick pan and bake in the oven at 350°F until breading is golden brown and fish flaky white. 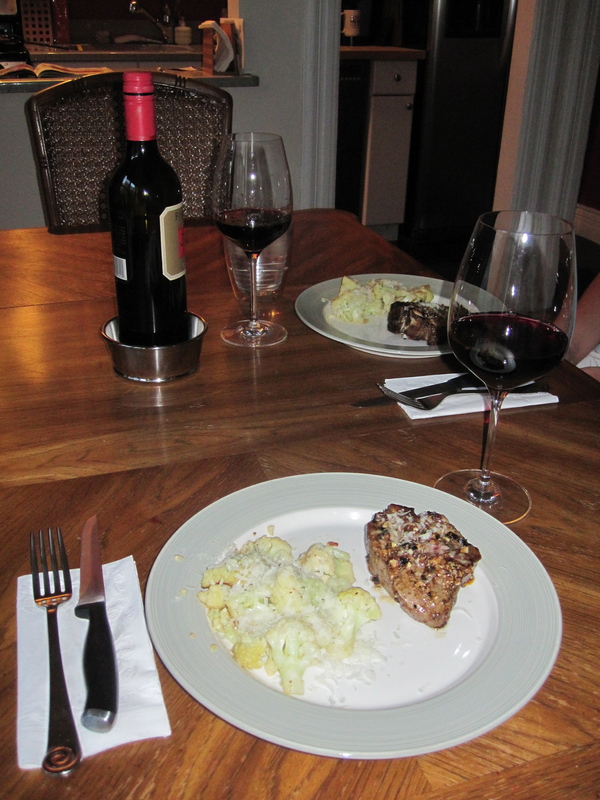 While the fish is baking, sauté your cauliflower in a drizzle of milk and 1/4 tbsp butter in a pan over medium heat. Add some fresh black pepper to taste, if desired. Just before the fish is done, place it under the broiler for 1-2 minutes to crisp up the breading. Heat your tortilla shells in the microwave with the ole damp paper towel trick. Slice up your fish, place inside the shells and serve amongst the fixins. Like I said, in no way would I ever enter this particular dish in a competition against the folks at Cabo. However, in a pinch, it satisfied my craving and I’m sure with some more serious efforts I might be able to replicate those delicious creations from the Cabo kitchen, including the jalapeño cheddar mashers! PS… have you tried any of the recent recipes? If so, let me know how they turned out below! You don't eat meat? I make lamb. Start by marinating the lamb loins in your favorite Balsamic Vinaigrette. Don’t go overboard, 20-30 minutes will be fine. While the lamb is marinating prep your spices. Chop up about four cloves of fresh garlic, sprinkle in some thyme and fresh ground black pepper (coarse if possible). Dump your spice mixture into the marinade and shake real good a few times. Place the lamb on a broiler pan and broil on Lo for approximately 12 minutes. In the meantime put your cauliflower (chopped up) into the warm butter. Let that simmer over medium heat for a few minutes until about half the butter is gone. Then pour in the milk and cover. Steam this mix until the milk is almost all soaked up. 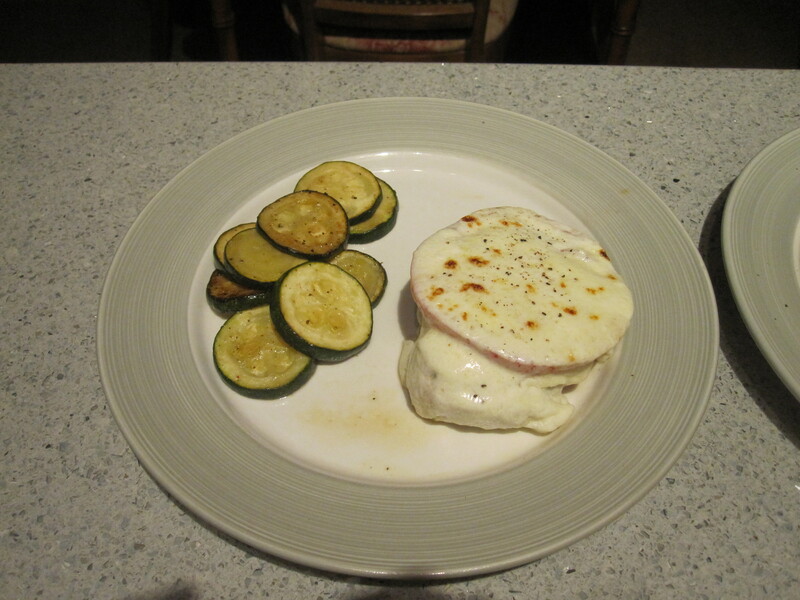 Grate yourself a fair amount of fresh Pecorino Romano cheese, about 1/2 cup or so should be plenty. Pull off your cauliflower once all the butter/milk mixture has been steamed or soaked up and place on serving plate. 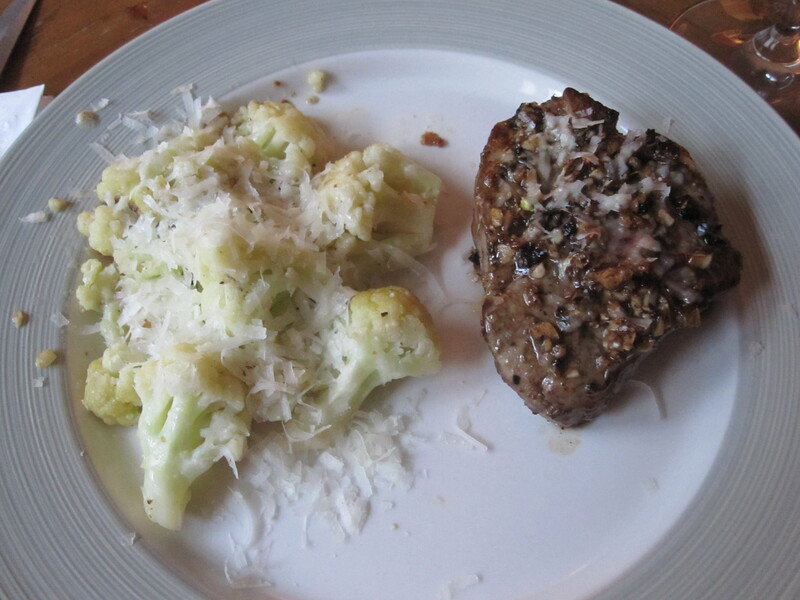 Add the lamb loin and sprinkle the fresh cheese mostly over the cauliflower leaving just a hint on the lamb. In this case Miss Fancy Boots picked out a wonderful California Red Blend called Lot 96. It was 40% Zinfandel, 40% Sangiovese and 20% Petit Syrah. Quite tasty and a heckuva good nose on the thing. It paired just swimmingly, kudos to MFB. Walk into the bathroom of a Baby Boomer’s house and you’re more than likely to find a magazine rack/holder/basket/etc. Why is that? Well without going into any more detail than the title of this here post, I think we all know. I’ve seen some wonderful displays in my time. Everything from the man inspired Golf Digests, ESPN Magazines, Men’s Healths, GQs to the broader appealing Southern Livings, Coastal Livings, Real Simples, etc. Some folks even keep the daily papers in their bathrooms or the most recent book they’ve been reading. The need to keep some reading material in the “public” bathroom of your house has become a staple amongst the Baby Boomers. But what about the Millenials? We’re different. We (as a group, not me personally) have come to favor digital over physical. We’re attached to our iPhones, iPads, Kindles, Nooks, etc. Heck even some of the younger Baby Boomers are converting to digital. I’m willing to take a risk and say the days of reading material in the bathroom are quickly approaching their end. I’m confident that when I’m a proud homeowner there won’t be any papers, magazines, or books in my bathroom(s). I think instead I will have a strict BOYRM (Bring Your Own Reading Material) policy. What else does the future hold? Well first things first, there won’t be anymore magazine stands, holders, or baskets. But, thanks to Kickstarter, we now have awesome iPad bathroom stands. Now all we need is for someone to develop an app that includes all your wanted reading material in one easy to find and navigate place. Think of it as a RSS feed app combined with the New York Times app and the CNN app and the ESPN app and yeah, you get the point. 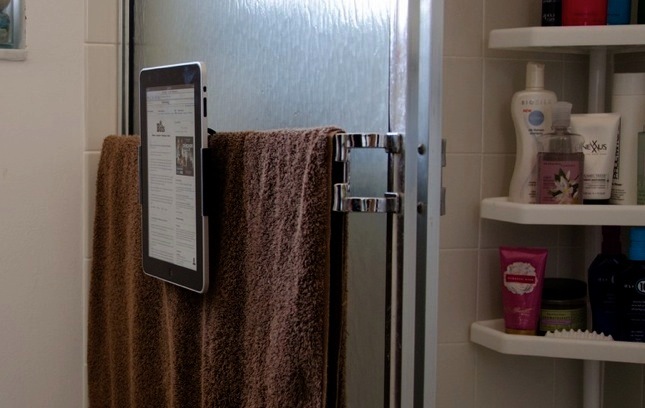 Either way keep an eye out in a few years for the first iPad bathroom stand in someone-you-know’s home and think of this post when you do. In the meantime, always make sure your iPhone is securely placed inside your pockets before dropping your drawers or it’s highly likely it’ll end up in the pot.